Caption - Austrian Railways (OBB) class 52 Kriegslok 52.862 is seen at Wien Ost in June 1972. 6,161 of these German wartime 2-10-0's were built and were scattered across Europe at the end of hostilities including over 300 in Austria. 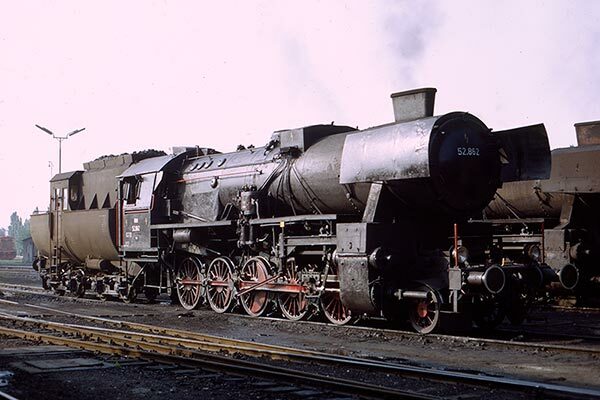 In many ways, the numerous and rugged Kriegloks extended the life of steam operation for enthusiasts. This example, with its tender providing accommodation for the guard, was built by Oberschlesische Lokomotivwerke Krenau (Chrzanow) in Poland during 1944. 52.862 was withdrawn a few years later in November 1974.